This entry was posted in Uncategorized and tagged funny, humor, memes, quotes, skydiving by luckyotter. Bookmark the permalink. LoL. I’ve never heard that one before. I haven’t either. I had to read it twice to realize it wasn’t serious! Steven Wright’s humor is unique. Love it. I have a tendency to do everything backwards the first few times I attempt to do something new. It’s like I have dyslexia when it comes to manual skills, and it is frustrating and embarrassing. So definitely no sky diving for me! Although I did go for a hot air balloon ride once, on my fiftieth birthday. It wasn’t so bad, because the pilot did most of the work. But the landing…. OMG!! No more hot air ballooning for me. And no sky diving. I thought once about hot air ballooning until I saw that little basket. No way was I going up in the sky standing in a basket the size of my fridge. No way. I know, right? But I was surprised by how many people fit in that little basket! At first there was just going to be me and the big hunky pilot. He asked .e out on a date, by the way. But my divorce was just final and I wasn’t ready, so I said no. And then, at the last minute, just before we were about to take off, an older couple showed up with their twenty-something daughter and her boyfriend. They all wanted to ride too, because they said they were celebrating their daughter’s divorce from some other guy just becoming final. So that made a total of six adults, plus the pilot’s little dog, on my flight. It was crowded!! The mother of the young woman who had gotten divorced freaked out as soon as we were aloft. She was crying “I can’t do this, I can’t do this!” So the pilot held steady and talked softly to her until she settled down. Then he asked her if she wanted him to land and let her get out and she said no. So away we floated, for about an hour, along the Rio Grande outside of Albuquerque. It was really very peaceful…. until the hard bouncing landing. Ouch! I have pictures of me and the pilot on the balloon, that the older woman took, which she later mailed to me. That was so sweet of her. I need to dig them out and post them some time. What a cool story! You should write a blog post when you start to blog again. i do that a lot too but I had never put it to words before. .. sometimes something was much simpler too than I made it out to be, I feel like it must be rocket science.. and I undo to do,or like you said in reverse/backwards..i am sure though we are developing skills this way though! I used to fail algebra tests with long equations down the side of the page lol, when it turned out to be so staggeringly and embarrassingly simple! and easy! Hi Susan. Years ago I read somewhere that people who have had a lot of trauma in early childhood tend to have difficulty learning skilled physical tasks. Things like spatial relations, etc, are difficult for people with a history of early trauma and abuse, according to what I read. I wish I could remember where I read that. I am not sure, either, if this was simply someone’s opinion or one person’s observation, or whether there had been any double blind scientific studies on this premise. But in my case it is definitely true. I have a high IQ and I made straight A’s in nursing school. But when it came to doing medical procedures on patients, I had to concentrate very hard to get the sequence of the steps right. It’s a pain! wow I definitely had early childhood trauma. I am so worried lately that I have forgotten completely almost what has happened. total black out. I thought that should be a blessing..but I am so distracted/disorganized.. it isn’t gone.. its an elephant in the room or a locked up closet I cant tell which.. I also am very good on paper/test taking skills… but hands on not so much. I thought I had A.D.D. someone said maybe I have a mild autism , I was like no I am just traumatized! its hard to be a puzzle to other people as well..professionals too when we are the ones who needed help ..as children and now as well. My heart goes out to you Susan, because I know what it’s like, the invisible elephant in the room. Pete Walker’s book Complex PTSD and Judith Lewis Herman’s book Trauma and Recovery both do a great job of explaining how early childhood trauma affects us throughout life. They also have a lot of helpful tips on how to live with and even overcome these effects, as much as possible. It isn’t easy but I have come a very long ways in my healing journey, so I know that healing is possible. Maybe not 100%, but enough to make life good again! I am able to line it up now. that’s why I am going through years of severe social anxiety but something keeps telling me it is normal and just needed to come up and out this way..im not hiding anymore.. so that is terrifying.. but I am just facing it. its new for me. still learning. its just that I know its “out” and raw and on my face at all times etc.. I feel exposed so I get anxiety and run away from people.. its mortifying to be close to crying(or show hands trembling or other signs of discomfort) in public.. on just any ole day doing a random mundane errand… yet at the same time I am finally coming to grips with it..my reality and truth and why I do that! why I feel the way I feel.. instead of just standing in shock of myself which didn’t really help….huge strides for me. I don’t really feel like myself though. I miss my inner world /sanctuary. its been stripped somehow. its not there. its me facing me and the world the way it really is.so I suffer many many days of “depersonalization” which is just about the very worst thing I have ever felt.makes you wish to be dead smack in the middle of your chaos again instead to feel real. (although I couldn’t take a second of that ‘now’ but in a time travel sense..)..and alive..derealization/depersonalization.. is like an out of body experience. during this time other senses take over and I do well with business and other ventures.very ironic…to me.. like going through the motions…. depersonalization is the most insidious thing on the planet. even if youre having a worst day or experience at least in all other distresses you feel you are yourself,alive real.. in the moment..
its coming with a lot of feelings of shame and humiliation as I look back and see the real deal.. just how low it is… the lowness of people.. the shame falls on me not them.as far as I can tell which is why its so insidious. Susan, it’s sounds to me like you are making progress. But it doesn’t come without a lot of pain. Keep going, don’t stop. Linda, gotta say, I LOVED Pete Walker’s book! It helped me a lot! In fact, my therapist is reading it now. I wish more mental health professsionals were familiar and educated about C-PTSD. They are too quick to slap other labels on you because they just don’t KNOW. They go by the DSM, which is so limited, really, and try to fit people into little boxes. Fortunately, mine is not like that, but most of them are. Yup, that was me! I thought I had learning disabilities and Aspergers for most of my life. I’m starting to reclaim some of my ability to learn as the fallout from the trauma begins to fade just a little. I used to love rides — now I hate ’em. I’ve always wanted to do everything, just once. The water slide experience was a slippery diving swimsuit, four foot drop, and bruised tailbone! But fun while it lasted. My doctor kept asking me why I keep doing this stuff, since it usually ends in disaster. But you only live once. Ok… There are a lot of quotes on the Internets, but not quite like this one. LOL… just LOL! I have shared links to your blog in the past but this is my first official reblog! It just cracked me up!! I really appreciate it! This did make me LOL! 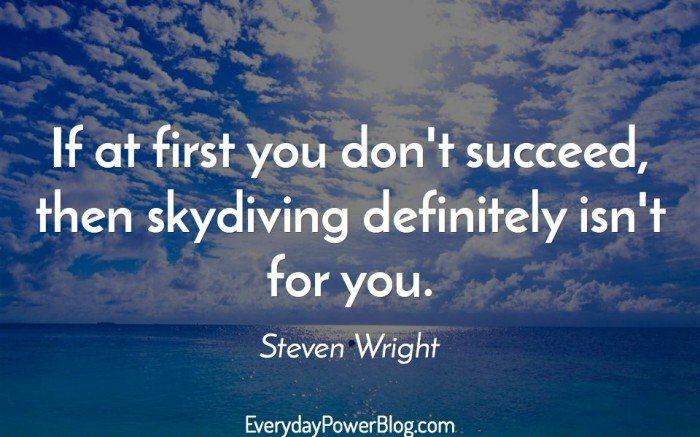 Thankfully I succeeded at my first attempt at skydiving!